Beneath Mexico’s Yucatan Peninsula is a warren of limestone caverns and sinkholes called cenotes. Flooded with fresh or saltwater, they have become a holy grail to scuba divers from around the world. Underwater routes have been blazed through dozens of cenotes, but the best is Dos Ojos, located 29 miles south of Playa del Carmen on the Riviera Maya. Like all mainland shore excursions from the port of Cozumel, the Dos Ojos trip starts with a 45-minute ferry from the island to the Yucatan Peninsula. A visit to Dos Ojos can be arranged on your own or through local outfitters like Bay Adventures in Cozumel. If going independently, you should take the ferry from Cozumel to Playa del Carmen, and then hire a taxi for the half-hour drive down the coast to Dos Ojos Scuba Dive Shop. It’s worth the ride. The world’s third longest underwater cave system, Dos Ojos stretches an amazing 51 miles beneath the jungle floor, and the water is exceptionally clear and warm. One-hundred-foot visibility is common, and divers can expect an average water temperature of 77 degrees F year-round. "Dos Ojos, which means ‘two eyes’ in English, refers to two neighboring cenotes, which connect into a very large cavern zone. It’s a must-do for divers of any recreational diving level looking for something different. Cenote diving is a unique and unforgettable experience." Several submerged routes are available: The Barbie Line takes divers through a well-lit subterranean wonderland of stalactites, stalagmites, and columns. The Bat Cave, a darker dive, winds around an air-filled bat cave. For those who really want to pump up their adrenalin, there’s the Pit — a deep sinkhole illuminated by sun rays that penetrate a hydrogen sulfate cloud floating near the surface. 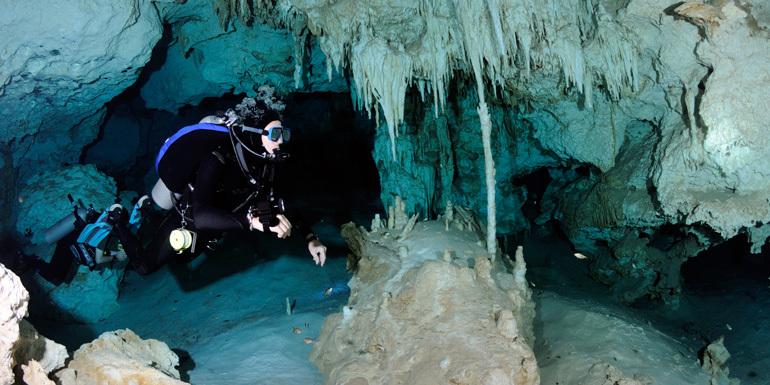 Cruisers can preview the cenote ahead of time by watching the 2001 Imax film “Journey Into Amazing Caves,” the 2006 BBC/Discovery Channel series “Planet Earth,” or a 2005 feature film called “The Cave,” all of which feature Dos Ojos. What do you like to do in Cozumel?